There's real substance here, not just wistful nostalgia. Superb recreation of E-MU's vintage hardware. E-MU's Emulator was the sampler of choice for many big-name electronic musicians in the '80s. Here UltimateSoundBank has painstakingly multisampled one to create "the ultimate digital version", packaged in a custom version of the company's proprietary UVI Workstation interface and weighing in at 5GB. Also included is Drumulation - a ROMpler made from samples of E-MU's crunchy 12-bit Drumulator. Both can be used standalone or as VST/AU/RTAS/MAS plug-ins. 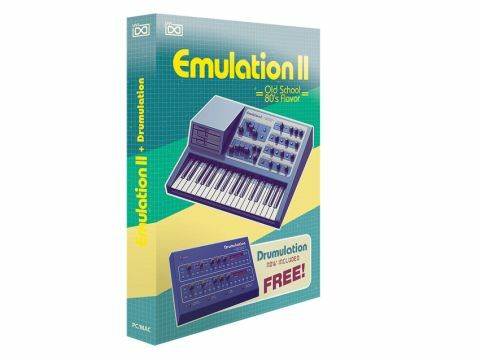 Emulation II's patch library has been compiled to be a comprehensive workstation, so it contains everything from drums, bass, bells, keyboards and mallets to choirs, strings, FX and synths. The samples might be 'old', but have retained their relevance, and the recreated Emulator controls (featuring a filter, envelopes, effects and bitcrusher) enable a considerable amount of shaping. Drumulation boasts around 500 drum sounds and provides eight channels of step sequencing. Emulation II and Drumulation give you the essence of one of the greatest samplers ever made and its drum machine sibling.